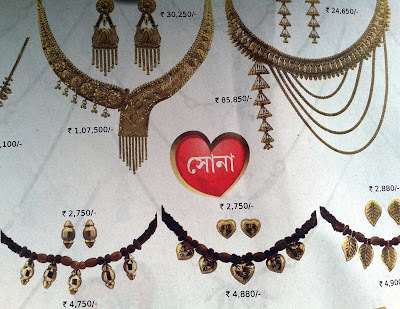 JAZH8WPSPBBU Bazaar Kolkata Poila Baisakh offers, 2012 Chaitra Sale discounts of Bazaar Kolkata Shopping Mall, Nnoni 1419 Chaitra Sale 2012 offers on Jewellery. Bazaar Kolkata Shopping Mall has started their exclusive discounts & offers for the 1419 Bengali New Year. Over the years, Bazaar Kolkata Shopping Mall is offering various schemes to the customers on purchasing / buying new products from Bazaar Kolkata Shopping Malls like Buy One Get One Free, Exchange Offers etc. This year, Bazaar Kolkata Shopping Mall has announced their Chaitra Sale 1418 (2012) and declared that customers will get up to 50% Off on selected items during the Chaitra Sale 1418 at Bazaar Kolkata Shopping Mall. Remember, the Chaitra Sale Offers at Bazaar Kolkata Shopping Mall has started on & from 24th March 2012 and will be there till 1419 Poila Baisakh. So, hurry on and visit your nearest Bazaar Kolkata Shopping Mall that are situated at Gariahat, Park Street, Lindsay Street, Behala, VIP Road (Bazaar Kolkata Shopping Malls in Kolkata), Asansol, Burdwan, Malda, Siliguri and Jamshedpur Bazaar Kolkata Shopping Mall. You may call Bazaar Kolkata Shopping Mall helpline phone number 033-32970707 for further queries regarding Bazaar Kolkata Shopping Mall Chaitra Sale Offers in 2012 (1418-1419). 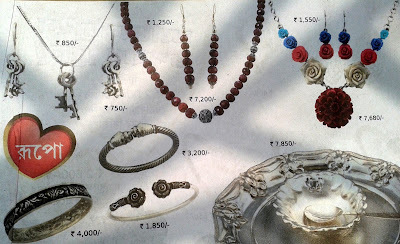 What if you get discounts on Jewelry & Ornaments on this Chaitra Sale 2012? Nnoni Jewellery Showrooms of Kolkata & Bengal announces their exclusive Chaitra Sale 1418 (2012) discounts on contemporary jewellery and other silver, pearl jewelleries. Nnoni Jewellery Showrooms of Kolkata is offering Chaitra Sale during 1st April & 14th April 2012 and during this period of Chaitra Sale 2012 Nnoni is offering 50% Discount on all ready-made products and 10% discounts on Silver Jewellery, 25% discount on Pearl Jewellery and 15% discount on Costume Jewellery products. Nnoni is an Anjali Jewellers initiative and you will get to know all Nnoni Showroom lactations from www.nnoni.in. Nnoni Jewellery Showroom Beadon Street Kolkata is an initiative of famous Jewellery Showroom Anjali Jewellers in Kolkata, Howrah and Hooghly district of Bengal. 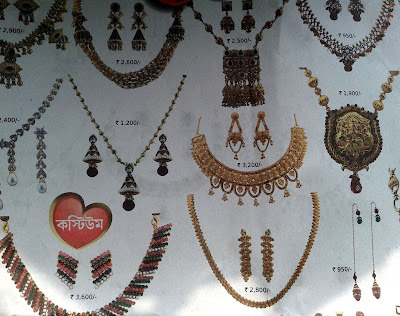 Beadon Street Nnoni Jewellery Shop Kolkata deals with modern fashionable cheap contemporary jewellery of Silver, Pearl and Costumed. The Nnoni Jewellery Store Beadon Street Kolkata opens all seven days between 10:30pm to 8:30pm. Those who are thinking where is Beadon Street Nnoni Showroom in Kolkata and how to reach or which route to follow to reach Nnoni Beadon Street Jewellery Shop in Kolkata; they need not to worry as several buses routes are available. Just, remember that you need to go near to Beadon Street and C.R. Avenue Crossing of Kolkata. If you have faced any sort of misbehaviors from Nnoni Beadon Street Showroom or you have any suggestions, feedbacks Complaints against Beadon Street Nnoni Showroom of Kolkata then write to customercare@nnoni.in. For further details on Nnoni Beadon Street Showroom Kolkata and to know latest Durga Puja Collection at Nnoni Beadon Street Kolkata or to know the Jewellery Prices Costs at Nnoni Beadon Street Showroom Kolkata please visit www.nnoni.in website of Nnoni Jewellery Showroom. Nnoni Jewellery Showroom Dumdum Nagerbazar Kolkata is an initiative of famous Jewellery Showroom Anjali Jewellers in Kolkata, Howrah and Hooghly district of Bengal. Dumdum Nagerbazar Nnoni Jewellery Shop Kolkata deals with modern fashionable cheap contemporary jewellery of Silver, Pearl and Costumed. The Nnoni Jewellery Store Dumdum Nagerbazar Kolkata opens all seven days between 10:30pm to 8:30pm. Those who are thinking where is Dumdum Nagerbazar Nnoni Showroom in Kolkata and how to reach or which route to follow to reach Nnoni Dumdum Nagerbazar Jewellery Shop in Kolkata; they need not to worry as several buses routes are available. Just, remember that you need to go near to Santragachi More of Dumdum Nagerbazar Kolkata. If you have faced any sort of misbehaviors from Nnoni Dumdum Nagerbazar Showroom or you have any suggestions, feedbacks Complaints against Dumdum Nagerbazar Nnoni Showroom of Kolkata then write to customercare@nnoni.in. For further details on Nnoni Dumdum Nagerbazar Showroom Kolkata and to know latest Durga Puja Collection at Nnoni Dumdum Nagerbazar Kolkata or to know the Jewellery Prices Costs at Nnoni Dumdum Nagerbazar Showroom Kolkata please visit www.nnoni.in website of Nnoni Jewellery Showroom. Nnoni Jewellery Showroom Beleghata Kolkata is an initiative of famous Jewellery Showroom Anjali Jewellers in Kolkata, Howrah and Hooghly district of Bengal. Beleghata Nnoni Jewellery Shop Kolkata deals with modern fashionable cheap contemporary jewellery of Silver, Pearl and Costumed. The Nnoni Jewellery Store Beleghata Kolkata opens all seven days between 10:30pm to 8:30pm. Those who are thinking where is Beleghata Nnoni Showroom in Kolkata and how to reach or which route to follow to reach Nnoni Beleghata Jewellery Shop in Kolkata; they need not to worry as several buses routes are available. Just, remember that you need to go near to Alochaya Cinema Hall of Beleghata Kolkata. If you have faced any sort of misbehaviors from Nnoni Beleghata Showroom or you have any suggestions, feedbacks Complaints against Beleghata Nnoni Showroom of Kolkata then write to customercare@nnoni.in. For further details on Nnoni Beleghata Showroom Kolkata and to know latest Durga Puja Collection at Nnoni Beleghata Kolkata or to know the Jewellery Prices Costs at Nnoni Beleghata Showroom Kolkata please visit www.nnoni.in website of Nnoni Jewellery Showroom. Nnoni Jewellery Showroom Chandannagar Hooghly is an initiative of famous Jewellery Showroom Anjali Jewellers in Hooghly, Howrah and Hooghly district of Bengal. Chandannagar Nnoni Jewellery Shop Hooghly deals with modern fashionable cheap contemporary jewellery of Silver, Pearl and Costumed. The Nnoni Jewellery Store Chandannagar Hooghly opens all seven days between 10:30pm to 8:30pm. Those who are thinking where is Chandannagar Nnoni Showroom in Hooghly and how to reach or which route to follow to reach Nnoni Chandannagar Jewellery Shop in Hooghly; they need not to worry as several buses routes are available. Just, remember that you need to go near to Padripara on G.T. Road of Chandannagar in Hooghly District of Bengal. If you have faced any sort of misbehaviors from Nnoni Chandannagar Showroom or you have any suggestions, feedbacks Complaints against Chandannagar Nnoni Showroom of Hooghly then write to customercare@nnoni.in. For further details on Nnoni Chandannagar Showroom Hooghly and to know latest Durga Puja Collection at Nnoni Chandannagar Hooghly or to know the Jewellery Prices Costs at Nnoni Chandannagar Showroom Hooghly please visit www.nnoni.in website of Nnoni Jewellery Showroom. Nnoni Jewellery Showroom Madhyamgram Kolkata is an initiative of famous Jewellery Showroom Anjali Jewellers in Kolkata, Howrah and Hooghly district of Bengal. Madhyamgram Nnoni Jewellery Shop Kolkata deals with modern fashionable cheap contemporary jewellery of Silver, Pearl and Costumed. The Nnoni Jewellery Store Madhyamgram Kolkata opens all seven days between 10:30pm to 8:30pm. Those who are thinking where is Madhyamgram Nnoni Showroom in Kolkata and how to reach or which route to follow to reach Nnoni Madhyamgram Jewellery Shop in Kolkata; they need not to worry as several buses routes are available. Just, remember that you need to go near to Bijoynagar on Sodepur Road of Madhyamgram Kolkata. If you have faced any sort of misbehaviors from Nnoni Madhyamgram Showroom or you have any suggestions, feedbacks Complaints against Madhyamgram Nnoni Showroom of Kolkata then write to customercare@nnoni.in. For further details on Nnoni Madhyamgram Showroom Kolkata and to know latest Durga Puja Collection at Nnoni Madhyamgram Kolkata or to know the Jewellery Prices Costs at Nnoni Madhyamgram Showroom Kolkata please visit www.nnoni.in website of Nnoni Jewellery Showroom. Nnoni Jewellery Showroom Baghajatin Kolkata is an initiative of famous Jewellery Showroom Anjali Jewellers in Kolkata, Howrah and Hooghly district of Bengal. Baghajatin Nnoni Jewellery Shop Kolkata deals with modern fashionable cheap contemporary jewellery of Silver, Pearl and Costumed. The Nnoni Jewellery Store Baghajatin Kolkata opens all seven days between 10:30pm to 8:30pm. Those who are thinking where is Baghajatin Nnoni Showroom in Kolkata and how to reach or which route to follow to reach Nnoni Baghajatin Jewellery Shop in Kolkata; they need not to worry as several buses routes are available. Just, remember that you need to go near to Baghajatin More in South Kolkata. If you have faced any sort of misbehaviors from Nnoni Baghajatin Showroom or you have any suggestions, feedbacks Complaints against Baghajatin Nnoni Showroom of Kolkata then write to customercare@nnoni.in. For further details on Nnoni Baghajatin Showroom Kolkata and to know latest Durga Puja Collection at Nnoni Baghajatin Kolkata or to know the Jewellery Prices Costs at Nnoni Baghajatin Showroom Kolkata please visit www.nnoni.in website of Nnoni Jewellery Showroom. Nnoni Jewellery Showroom Batanagar South 24-Parganas is an initiative of famous Jewellery Showroom Anjali Jewellers in South 24-Parganas, Howrah and Hooghly district of Bengal. Batanagar Nnoni Jewellery Shop South 24-Parganas deals with modern fashionable cheap contemporary jewellery of Silver, Pearl and Costumed. The Nnoni Jewellery Store Batanagar South 24-Parganas opens all seven days between 10:30pm to 8:30pm. Those who are thinking where is Batanagar Nnoni Showroom in South 24-Parganas and how to reach or which route to follow to reach Nnoni Batanagar Jewellery Shop in South 24-Parganas; they need not to worry as several buses routes are available. Just, remember that you need to go near to Nungi Railway Station of Batanagar South 24-Parganas. If you have faced any sort of misbehaviors from Nnoni Batanagar Showroom or you have any suggestions, feedbacks Complaints against Batanagar Nnoni Showroom of South 24-Parganas then write to customercare@nnoni.in. For further details on Nnoni Batanagar Showroom South 24-Parganas and to know latest Durga Puja Collection at Nnoni Batanagar South 24-Parganas or to know the Jewellery Prices Costs at Nnoni Batanagar Showroom South 24-Parganas please visit www.nnoni.in website of Nnoni Jewellery Showroom. Nnoni Jewellery Showroom Garia Kolkata is an initiative of famous Jewellery Showroom Anjali Jewellers in Kolkata, Howrah and Hooghly district of Bengal. Garia Nnoni Jewellery Shop Kolkata deals with modern fashionable cheap contemporary jewellery of Silver, Pearl and Costumed. The Nnoni Jewellery Store Garia Kolkata opens all seven days between 10:30pm to 8:30pm. Those who are thinking where is Garia Nnoni Showroom in Kolkata and how to reach or which route to follow to reach Nnoni Garia Jewellery Shop in Kolkata; they need not to worry as several buses routes are available. Just, remember that you need to go near to Mahamayatala of Garia Kolkata. If you have faced any sort of misbehaviors from Nnoni Garia Showroom or you have any suggestions, feedbacks Complaints against Garia Nnoni Showroom of Kolkata then write to customercare@nnoni.in. For further details on Nnoni Garia Showroom Kolkata and to know latest Durga Puja Collection at Nnoni Garia Kolkata or to know the Jewellery Prices Costs at Nnoni Garia Showroom Kolkata please visit www.nnoni.in website of Nnoni Jewellery Showroom.